.....but I can, and for some reason this pleases me more than it should. 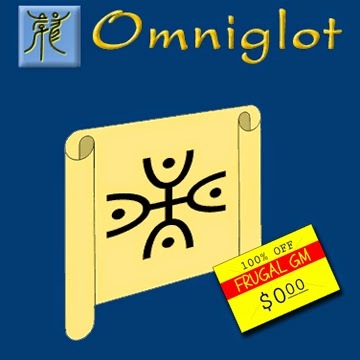 Omniglot is an interesting little website that has quite a few good uses...even for players. My current HackMaster is one of those "once-in-a-lifetime" PCs, a statistical anomaly for sure, but he started off the game being rather racist and didn't even know any language other than Dwarven. Well, technically he knew a little bit of one of the human languages, but not much. I played this up by using a crib sheet of phrases in Dwarven. "But Chris....you don't know Dwarven....it isn't a real language!" OK, you got me there, but I simply decided that I'd use Icelandic as a substitute. Google Translate helped some, but in my experience a lot of common phrases don't necessarily translate directly (some swears come to mind), so I need a little linguistic help. Omniglot has some nice (i.e. "Clean" references) as well as some links to more. I especially like the help with pronunciation so when my Dwarf asks a foe "Viltu dansa við mig?" I can say it right. Oh....."Viltu dansa við mig?" translates to "Would you like to dance?" My first stumbling upon Omniglot was to find some obscure fantasy fonts, which can be found in the "Fictional Scripts" section. Fricken jackpot! Some even have downloadable fonts to use. I highly suggest just getting to the site and poking around......if you find a font you like and want to use, but doesn't exist, I'd suggest this Free GM Resource.